Many of us store unleaded petrol in a can for several weeks and there is always a few gallons (whoops; several litres) in the car's tank as it stands unused between outings. I have been told that petrol ‘goes off’ after about three weeks, but what effect might using stale fuel have on a ‘Seven’? I did a ‘Google’ search for ‘stale fuel’ and found some information on several question and answer sites. Apparently you can store fuel in a sealed container, kept cool and out of direct sunlight, for around six months before it starts to deteriorate. If the container is not properly sealed, or is frequently opened, the fuel will start to evaporate and some of the light components in the fuel can be lost. The light components include butane and as they are lost, the fuel loses its volatility, and the car is difficult to start. Fuel in the car tank can last for up to four weeks before it becomes much denser. When this happens, the engine is effectively over-fuelled and there’s an increased chance of carbon deposits onto spark plugs and inside the combustion chamber. Others stated that fuel will go off in the fuel tank quite quickly once it’s a couple of weeks old and felt that the brand of fuel was a contributory factor. One recommended that it is good practice to add about 25% fresh fuel to the tank every few weeks. Fine, so perhaps it is best with a little used historic car to keep the fuel level in the tank relatively low, and only fill up with as much as you will need for the outing; ie do not refuel before arriving home from a run and then leave the car standing for several weeks but fill up before the run. The low compression ‘Seven’ engine was designed to run on low grade petrol available in the 1920's/30's apparently equivalent to 74 Octane, so 95 Octane unleaded petrol that might become a ‘stale’ 91-93 Octane fuel is still well above the original design criterion for our engine. I try and take my ‘Big Seven’ for a run every 10 days or so, but after a few weeks of being unused, ie holidays, I do notice that it does not always start ‘first time’ although that can be due to the condition of the battery, the engine oil thickening etc; but the engine starts and soon ticks over quite nicely. It purrs along whenever I take it out so I have not found anything to worry about; I do not notice any loss in a performance that is already relatively poor, and given that the carburettor settings and timing adjustment are never perfect, then any small deterioration in fuel quality might just be of little consequence. The noticeable sluggishness on some days is more likely to be due to the air temperature and humidity. I do a 3-monthly service, which is about every 300 miles or so, and usually find some crud when I clean the carburettor, does the crud come from deteriorating petrol? After I raised the question about stale fuel, I was given information which identified ‘keywords’ for further research to find websites which provided more detail, and an explanation of why fuel 'goes off'. Petrol, diesel fuel and lubricating oil are hydrocarbons which are unstable and quickly deteriorate. When the car is left unused the petrol in the tank, being in contact with oxygen, deteriorates quickly due to the evaporation of the ethanol content, so the octane rating is reduced and the characteristic poor starting and running problems arise. Even under ideal storage conditions petrol will deteriorate by about 25% in a month. This is a short-term problem usually solved by adding a quantity of fresh fuel. There is another aspect to the problem of stale petrol and diesel fuel which can occur over longer periods of non-use. When plant materials were laid down millions of years ago microbes were present as the crude oil formed and when it was extracted. Some microbial residues remain in all fuels after the refining process and, with additional contamination arising from the non-sterile conditions of storage and transport before we purchase the product; some will be transferred to the car fuel tank. (Note that microbes = algae = ‘bugs’). Water is always present in fuels accumulating as natural, and unavoidable, condensation from the air which is more likely to occur during the winter months. Water provides the oxygen for microbiological growth, forming yeast, mould and bacteria and the higher the temperature the more rapid the growth, causing petrol to quickly deteriorate further. Once established the microbe population doubles in about 20 minutes. Because water is heavier than petrol it sinks, with the microbes, to the bottom of the tank. In the majority of fuel tanks most of the water and sludge will be below the draw-off point but it will be agitated by the movement of the car so that water and lengths of fine microbial threads enter the fuel pipes and carburettor. Water will pass through but the threads may become attached in the filters and jets. Dead microbes form acidic hydrogen sulphide and excess sulphur attacks copper seals etc. Presumably microbes will also weaken the tank lining and any flaking bits will add to the sludge over time. Poor starting, or hesitant running, indicates fuel starvation and many people will clean or change a filter, blow out the jets and the pipework, maybe add some fresh petrol. If the problem continues they might drain the tank, removing some of the sludge, and refill with fresh petrol, but this only offers a temporary solution as microbial residues and water molecules remain in the tank and will quickly contaminate the new supply. The best remedy is to drain and remove the tank from the car and steam clean to eradicate all traces of sludge and microbial residues and dry thoroughly. There are then three alternatives to try and lessen microbial growth: 1) exclude as much air as possible, to reduce the build up of condensation, by keeping the tank full. But this is not an option if the car is used infrequently as more petrol will deteriorate; 2) have only sufficient petrol in the tank for immediate use so as to minimise the quantity that will deteriorate and can be topped up with fresh petrol; 3) use fuel stabiliser additives and biocides, but these are not cost-effective with the low quantities that we are using. With the infrequent use of our cars we can better manage our petrol consumption and number 2 is the best option. If you lay-up the car for the winter months it may be best practice to drain the tank and carburettor, allow it to vent and use fresh petrol when preparing the car for the following year. One of the websites has the recommendation that fuel tanks should be drained and steam cleaned every five years or so when cars, boats etc., are only used infrequently. Apparently about 90% of engine failures at sea are caused by bad fuel, particularly in small craft unused for long periods by absentee owners. I now know why the restorer of my Big Seven remarked, without further explanation, that he had removed the tank, drained off the sludge and steam cleaned it. I merely thought that after 65 years there must be some sludge, and fine particles, in the tank having been told some time ago that it was formed by the petrol separating and settling and could be flushed out with clean fuel, never knowing that the sludge is formed by microbial growth. As a basic experiment I set up two jars with 100ml unleaded petrol in each and added 25ml of tap water. The water immediately settled at the bottom of the jars and the two fluids showed a clear demarcation line. The jars were then left on the garage bench in normal light, not direct sunlight etc. The result is rather interesting. 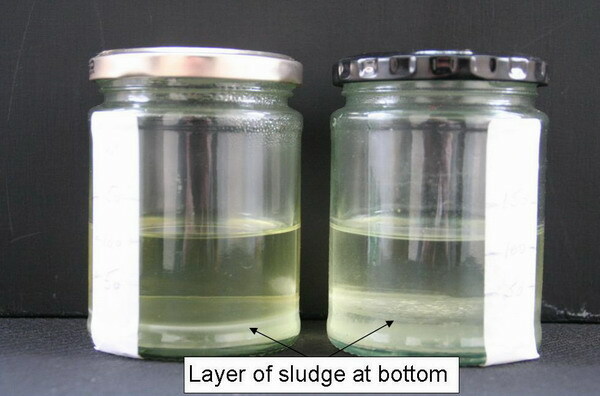 Both jars, after the four month period, have a significant layer of white sludge present at the bottom within the volume of water originally added. For some reason one shows almost double the depth of white sludge. Without access to any laboratory facility I am unable to arrange a test of the microbes but I am satisfied that petrol, with water ingress, develops a sludge which can create problems in a fuel system. Unfortunately I have not been able to offer a very clear photo but the layers can be seen. This information has been sourced from, and corroborated by, websites of Engineering Companies and University Departments. This article, written by Doug Castle, amalgamates articles which originally appeared in CA7C Seven Focus in Oct 2008 pp24-25, Apr 2009 pp18-19 and Dec 2009 p22.